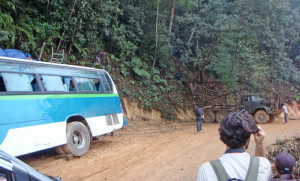 Our saungtheaw, a pick-up style public “bus” with two hard benches in the bed, finally emerges from the narrow rutted jungle track that had followed the tumbling Xam River for an hour, and we lurch to a stop in front of Ban Tao’s sole store. Our family and Mai, our translator and good friend, and several others along for the ride, stretch the kinks from our jarred bones and, seeking shade from the close and humid sun, huddle in the shade of a scraggly papaya tree. A half dozen locals adults, and perhaps 15 kids, all crowd close. It had been a couple years, we are told, since anyone remembers white people visiting their town. The road to Ban Tao. The store sells canned and dried goods as well as Chinese-made tools and plastics. Several varieties of potato-chip-like snacks in bright foil packets wait for attention. A fridge – and electricity, although sporadic, has only recently reached Ban Tao – proudly displays cold cans of Coca-Cola and bottles of Beer Lao and water. A few baskets of fresh vegetables and jungle fruits sit in front, seeking customers. A 10-pound iguana, with a trickle of blood on it’s alert face, is leashed with a rope to a wooden post – no, one won’t find fresher meat in the area. (And guess what Mai’s family had for dinner that night!). 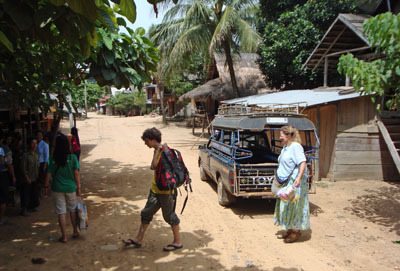 Arriving in front of the store in Ban Tao. 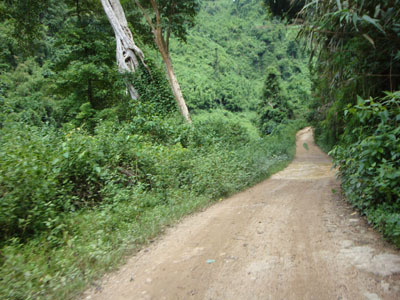 We had traveled to Ban Tao because it is renown for its sericulture. For generations, this small village of perhaps a couple hundred people has been central to raising the highest quality silk required by the incredible weavers of Houaphon Province. 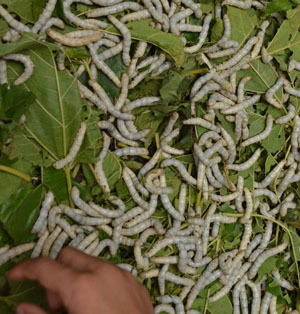 Ban Tao’s head inspects the silkworms. 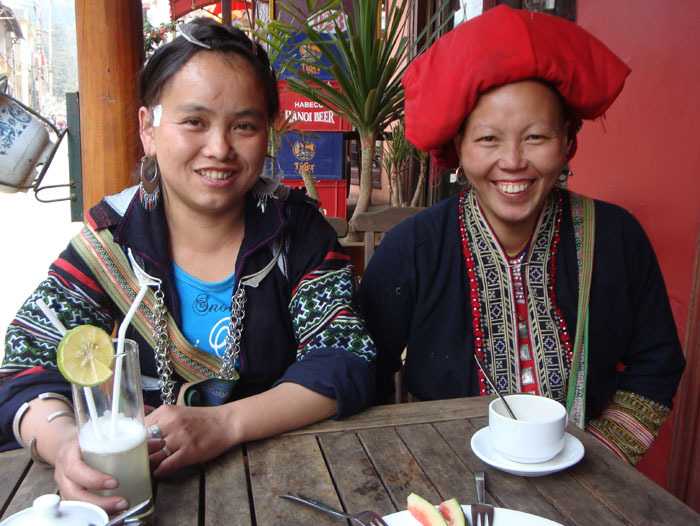 The elected head of the village appears, and Mai introduces herself and us. He nods and says he is honored that we would come to their village, but he is sad that we have come during the monsoon season as this was not a time for harvesting the silk – they just keep enough silk worms going to maintain their “crop” for the best growing season. He leads us, and the growing contingent of curious kids, to a small thatched roof house and immediately directs a group of young people to start a fire. 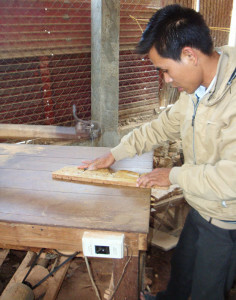 He was determined to show his special guests the full sericulture process. Smoke filled the now-crowded room – ten, fifteen, twenty people crowd in. Zall, eager to escape both the crowd and billowing smoke, pulls out a frisbee and a gaggle of boys rush out to play in the dirt-track street. The village head excuses himself – he has to attend an important function in recognition of a local policeman’s promotion. 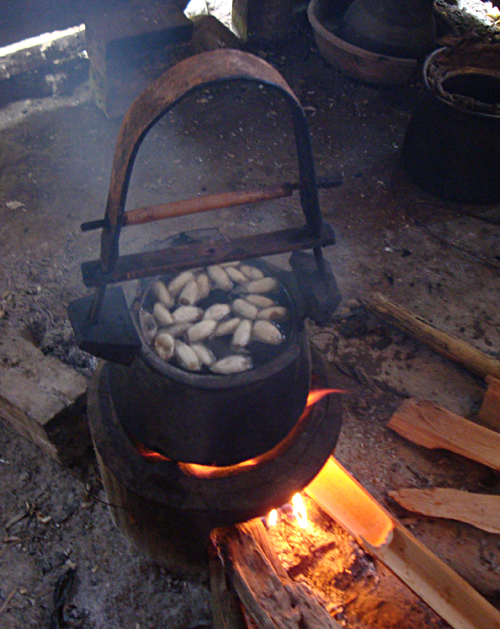 Preparing the hot water and silk cocoons for the demonstration. 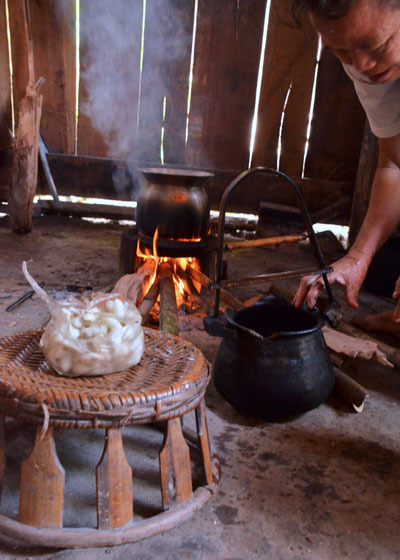 Some silk cocoons appear, presumably a few months old, and an elder woman, who was obviously now in charge of the production, quickly sets up pots of water to boil and pulls out a set of long sticks that helps her handle the cocoons. Maren wears a full smile, a bead of sweat hanging on her nose; Mai is trying to translate for three simultaneous talkers; a baby starts to cry. The grandmother sits down at the fire and the crowd pulls back a bit. 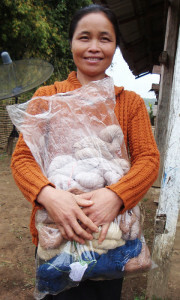 Yielding the two long sticks as if they were batons, she demonstrates how one takes a worm’s now-boiled cocoon and delicately pulls from the tiny, papoose-like bundle strands of exquisite thread that has been the treasure of royalty for millennia. We have seen the procedure before, but it seems important for our relationship with these kind people that they demonstrate their full expertise. Who are we to dictate the pace of a visit or the content of the exchange? An hour later we are led to another home. In the shade under the elevated floor, behind the fencing that keeps the roving chickens and ducks out, are trays of silkworms devouring fresh mulberry leaves. 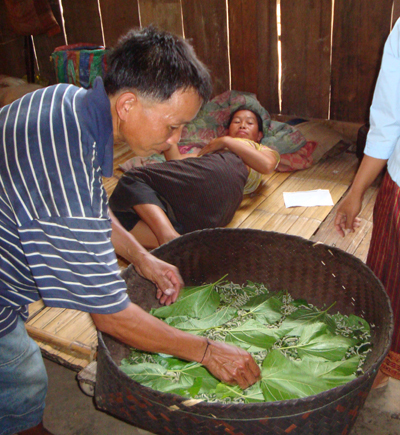 The continuing “crop” of silk is being carefully nurtured. 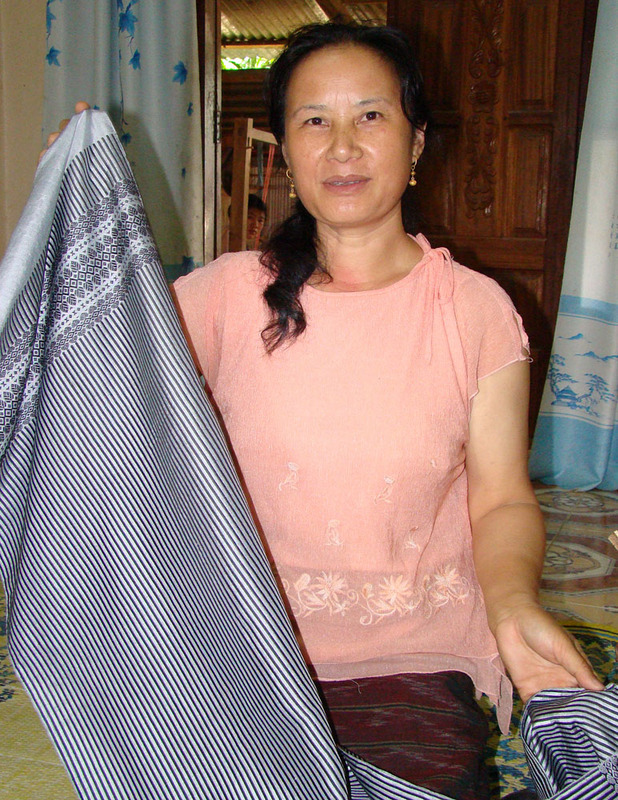 Demand for silk is high (thanks especially to the growing wealth of neighboring China and Vietnam), and for Ban Tao, this is the essential source of business that has supported the village for generations. Mai excuses herself to spend some personal time with an aunt and uncle who live in town (what town doesn’t she have relatives in?!). It must be exhausting to have Lao and English grammar jabbering simultaneously in one’s head, and we’ve always greatly appreciated the fact that Mai has never hesitated to set aside some personal time to “clear the noise.” It also forces us to practice our Lao language skills and hone our skills for developing connections without the benefit of a spoken vocabulary. Luckily, smiles and laughs, hand and body signals, and the willingness to be a bit of a ham has taught us that clarity can be sacrificed without a loss of personal connectivity and deeper, shared human understandings. 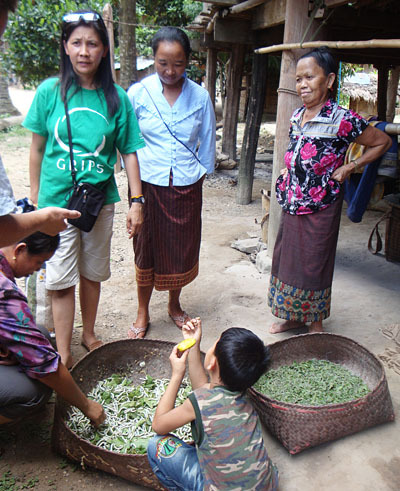 Mai, in green, translates for us as we learn about local sericulture. The sun’s bake drives us into the cool comfort of the village head’s home, a cement-brick structure with wooden shutters on the windows and a corrugated metal roof. The chief is still at the promotion party, but his wife treats us to glasses of cool water (from a bottle, thank you! ), and then she pulls out some older silks made in previous generations. Mai returns just in time and Maren and the chief’s wife engage in a deep discussion about the difference between older and newer textiles, local dyes, and the village’s sericulture tradition. I watch Maren secretly drool when a 50-year-old handwoven silk mosquito-net border appears. Zall and Maren on Main Street, Ban Tao. Zall stretches out in front of a slowly-turning fan and seems to melt into the ever-so-slightly-cooler vinyl floor. It is hot. Escaping into the bright heat, I hear pop music up the hill and turn my head. Some man – the village head it turns out – is waving for me to join. Then another dozen faces peer over a bamboo balcony, and a young man and woman, with big smiles, rush down to my side and insist, with a flurry of words, that I join the party. I’m handed a short glass of Beer Lao, and, following local tradition, I offer a nod of thanks and slork it down in one gulp (ah – a cold one on a hot day can be a good thing!). I hand back the glass only to be handed another a moment later, and then a tray of unidentifiable fried meat chunks (dog?) is offered, and a plate of bananas and some other plum-like fruit and then another glass of beer. 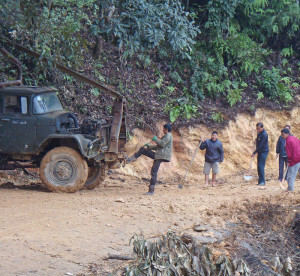 The Lao pop music – what I believe to be the same couple songs playing over and over – is turned up. The gentleman getting the promotion, who to me looks no older than 16, throws his arm around me and says something in a loud, slightly-slurred voice and everyone, including me, laughs. More toasts, more beers and then a giant jackfruit is cut open and shared. The village head comes to my side and over the din of a sappy pop song and the laughter offers what seems to be a more serious-minded toast. He looks me straight in the eye, and drinks the short glass himself. Immediately he refills the glass and hands it to me. I offer, in English, what I hope sounds like a humble thank you and then lift a toast to our shared moment of friendship and joy and indulgence. Everyone cheers – common language is so overrated sometimes. A Ban Tao elder poses with her silk coffin cover she wove when she was 17 years old. 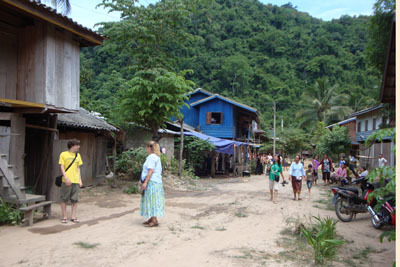 The next day, back at our accommodations in the more central town of Xam Tai, the head of Ban Tao suddenly appears. 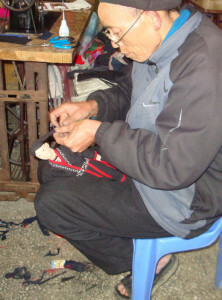 He has a friendly business relationship with our dear friend Souk, a master dyer and weaver, at who’s home we are staying. We share some food and drink (again the traditional exchange of beer – at 10 AM – although not enough to alter the day’s trajectory of tasks). Mai translates that the most important reason he visits today is to play a game of petanque (bocce ball) with me, one-on-one, on the small court set up in Souk’s front area. Mai’s eyes tell me that his invitation is formal and important – we had not yet had our full time together. 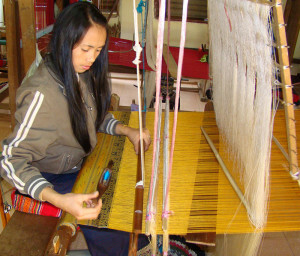 A young weaver shows off her creation. I can’t remember who won. But that shared half hour of petanque has really stuck with me. You don’t need shared language to share time and purpose and affection. We smiled and chatted in our respective languages, the content of the words secondary to the meaning of the communication. We laughed at our errors, cheered at our luck. Fate and opportunity – the ties that create friendships and business and purpose on all human levels – had created a bond that needed only be acknowledged to be empowered. Our roles were assured; our relationship formalized. And perhaps, in a small but important way, our larger purpose validated. It always happens. Just when we have maxed our budget for a village, someone else shows up with a beautiful textile. Chola modeling the butterfly scarves woven by her daughter that we bought the first time we met her. We first met the woman we have nicknamed “the ghop lady” – the frog lady – on our second trip to her town in Houaphon Province in NE Laos. We had packed our gear and purchases, and were about to leave town to head to the border with Vietnam, hoping to cross and find a ride to Hanoi that same day if possible. We were sitting on the bench outside our guest house, putting on our shoes, when a woman showed up with some beautiful scarves. With our very last few kip (Laos money) we purchased four scarves from her; two with butterflies, and two with a very traditional flower pattern and stylized frogs, or “ghop” in the Lao language; thus her nickname. 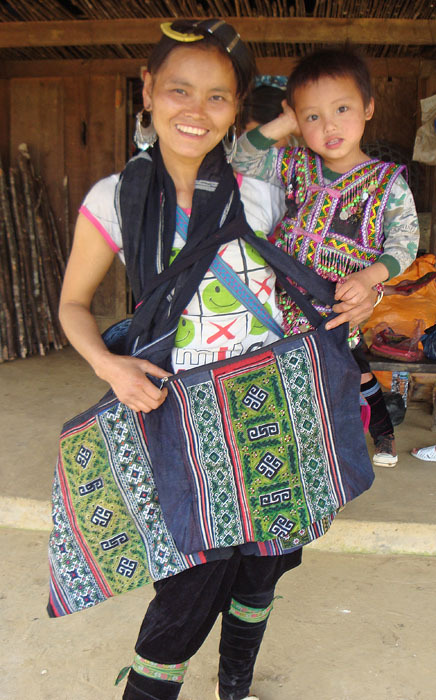 We came back to her town on our next trip, having sold three of her four textiles, and looking for more. This time, we showed photos of her we’d taken the previous visit (and you thought this was only for our customers!) to people in the market, asking if she had a stall in the market or a home nearby. No one is a stranger in these small towns, and soon we were knocking on her door and calling “sabaidee”. Unfortunately, she was out of town, in the capital of Vientiane, selling her textiles to the market vendors – we had missed her! 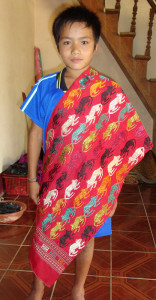 Chola’s son modeling the rat design door curtain he wove. On the next trip 6 months later, she was home and recognized us. She cheerfully invited us into her home where we were seated on handwoven floor-pillows, brought glasses of water, and a plate of local jicama and oranges to munch on while viewing textiles. While she went upstairs to get bags of textiles (literally – large plastic garbage can liners), her 8-year-old son sat shyly in the corner watching us. Chola put the fans on “high” to keep the sweating to a minimum (hah! ), and we started unfolding her offerings: beautiful shawls, narrow scarves, and even some pieces she had made as part of her wedding linens (just to show off as these were not for sale!). 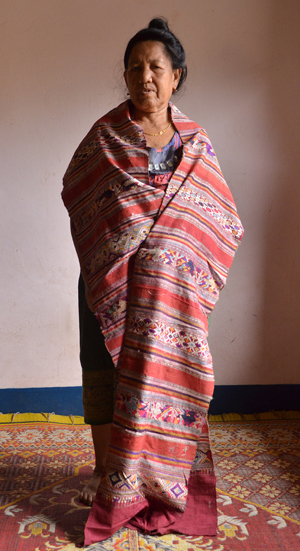 One of her older pieces was a delicately woven mosquito net made of a silk patterned band as long as a bed is around from which handspun, handwoven, indigo-dyed cotton was suspended both across the top and down the sides to reach to the floor – this provides not only bug protection, but also privacy given that all family members traditionally sleep in one room. She also showed us a beautiful door curtain, hung in place of an inside house door, that was silk on cotton. She is keeping these pieces for herself, and maybe for her daughter to inherit. To see such treasured pieces is a treat! Chola and her daughter taking the butterfly scarves off of the loom for us. One of the pieces she brought out of the bag was a door curtain with a repeated rat pattern. I fell in love with it and asked if she made it. She motioned to her son to come over, and said he had woven it when he was 7 years old. He was now embarrased to have woven it because, at the ripe old age of 8, he now thought of weaving as something women did, not boys. Despite his embarrasment, we took a photo of him displaying the piece. It is now one of my treasures! While we have found similar rat door curtains, this is the only one woven by him. The following season when we visited, we found Chola and her daughter out on the cement patio in front of their home; her 14-year old daughter was weaving on one of the two looms set up under a metal roof. And the daughter was weaving those exact butterfly scarves! We indicated that we would like to buy some, and they meticulously unwrapped the already woven scarves and cut them off of the loom, the daughter beaming shyly, but proudly, the whole time. Zall (also 14!) took photos of the butterfly scarves coming off of the loom. 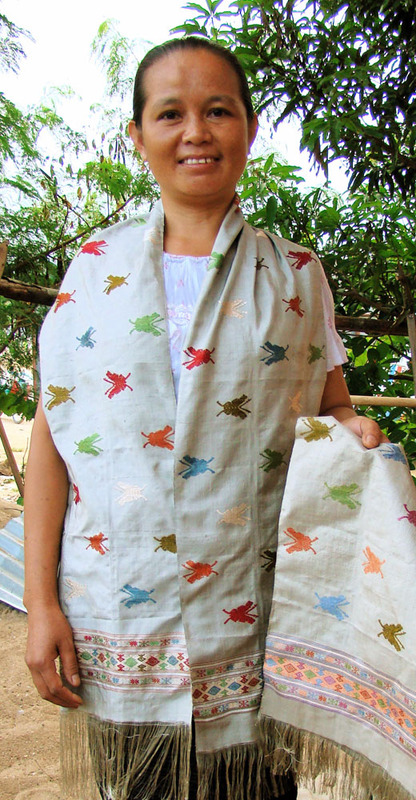 The daughter also wove narrow scarves with love birds on them – we couldn’t resist those either! Chola modeling her “story cloth” woven of naturally dyed local silk. The trip when Grandma came with us, we didn’t manage to visit until night was falling. Unfortunately, it was a night without electricity (not that uncommon in this region), and we made our selections by candlelight and flashlight! We often end up choosing textiles by the light of (I swear!) a 15 watt light bulb, but trying to make selections with a single candle’s glow was a new one even for us. Knowing the quality of the weaver’s goods makes a big difference under these circumstances. We did go back the next morning to pick up the scarves, as several of them needed to have the fringes braided. We also selected a couple more of her cheerful silks – the ones that haunted us overnight – all the while asking about the patterns and techniques. We have to acknowledge none of this conversation on this visit would have been possible without our good friend Mai, who grew up in Chola’s village but left after high school with a rare opportunity to attend college, learn English, and develop a professional career. 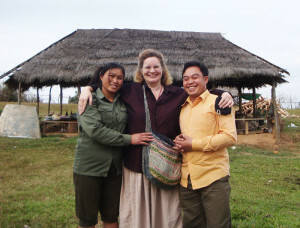 We usually have a translator with us on our visits to this village, but not always. Half of our conversations with Chola are a combination of sign language, Maren’s very limited Lao skills, a calculator, and constant laughter at our sometimes fruitless efforts to clearly communicate. The blend of translated and non-translated communication is part of what makes these relationships so fun! Chola and her daughter are now regular artists represented by Above The Fray. We always visit her when we go to that village, and hope that she is there. We have tried to call her in advance, through a friend and translator, but her phone never seems to work. It is just the luck of the draw if she is there and has textiles for us. Part of the adventure! An Amazing Talent Now Outlets in America! The master dyer and designer showing one of her new shawls. 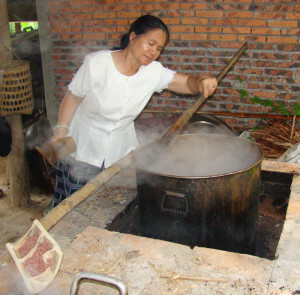 In 2006, on our first visit to Xam Neua (before Above the Fray), the local tourist office had casually recommended we visit her modest workshop. We did not have a translator but felt confident with our Lao-English dictionary and the calculator to see what she had to offer. She greeted us politely, indicated she knew no English, and invited into to sit down on an old couch. Glasses of water appeared, and then this woman brought out some textiles she had designed and made; our jaws dropped on the floor. A subtle modernist, she takes the traditional motifs of her Tai Daeng culture and creates her own private line of unique, exquisite silk scarves and shawls. Her motifs and designs are deceptively simple and elegant, and tend to avoid the more traditional complex geometric play. Her use of rich hues and buoyant color-play, all created using natural dyes, allow the energy of her silks to jump right off the shimmering textile and dance. She uses only the finest, thinnest quality of silk thread, and doesn’t fear bold, sharp images; the weaving quality is flawless. 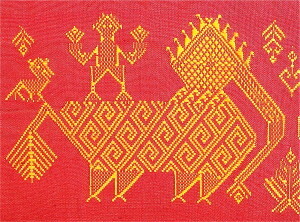 One of the traditional sets of motifs used by this designer in her shawls. 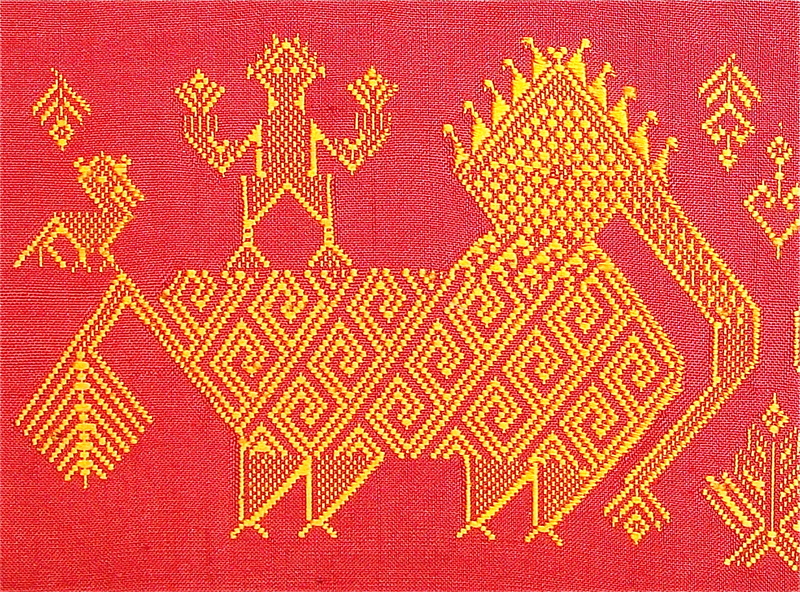 This shows a “siho,” or mythological elephant lion, which represents both political and fierce fighting strength; on its back is an ancestor spirit, who helps guide the shaman to the ancestor world to seek help; a “hong” bird, perched to the left, symbolizes male energy. Various flowers, and a spirit tree grow by the siho’s trunk. 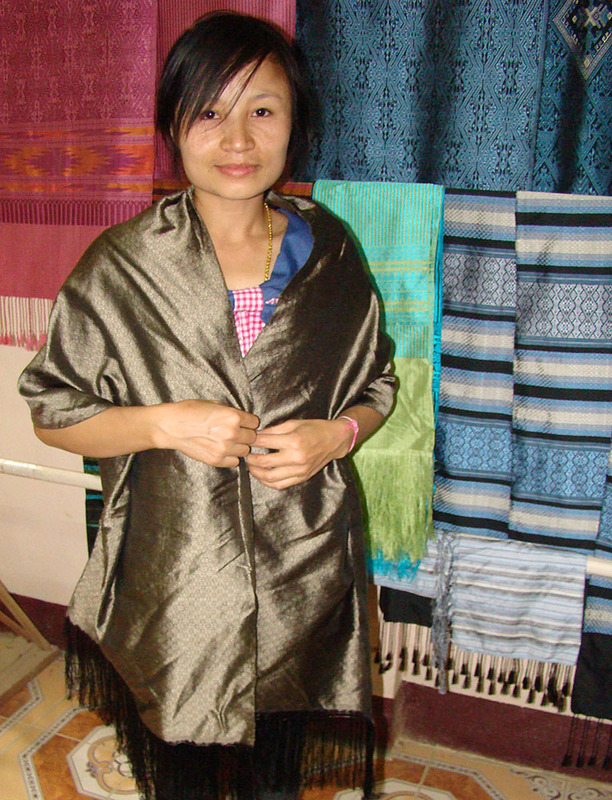 One of the young weavers modeling a shawl she just wove (note untwisted fringes) standing in front of finished shawls from the weaving works. 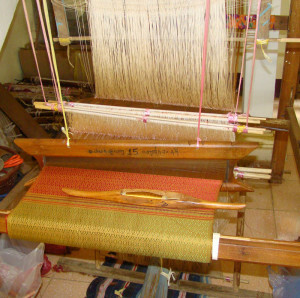 A weaver at work creating another masterpiece. All of the dyes are made from natural materials, even the bright turquoise on the shuttle she is using for the weft on this golden shawl! 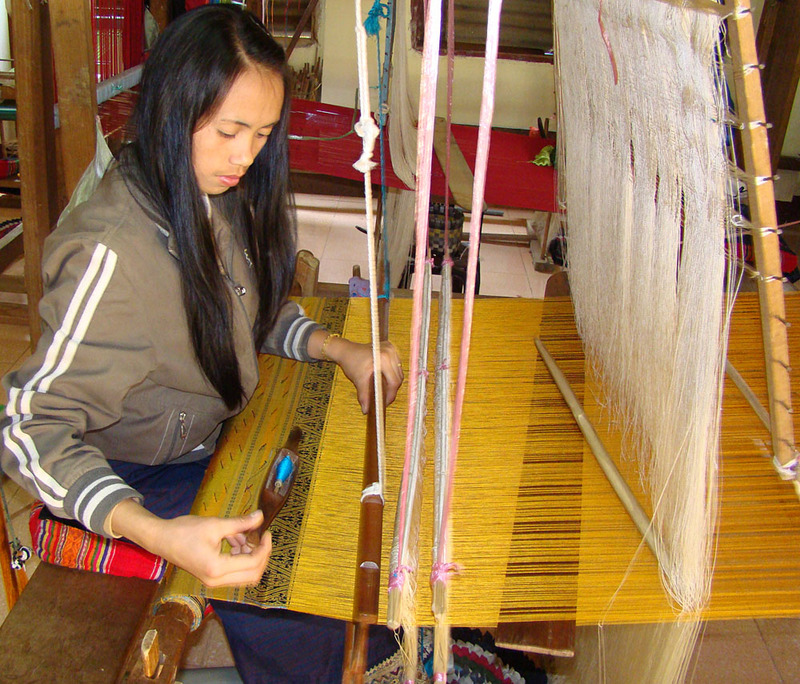 She manages a small roomful of younger weavers who operate hand-made wooden looms using the supplemental weft technique. We imagined her to be a tyrant of a boss – how else could her textiles be so unusually error-free? But no. On our several visits (now with translators) we hear nothing but giggles and chat as the young women slide their shuttles back and forth on the nine wooden, hand-made looms that sit in the adjacent room. They quickly get studious when we walk in to admire their creations (and snap a few pictures); the moment we leave, their casual and cheerful banter returns. 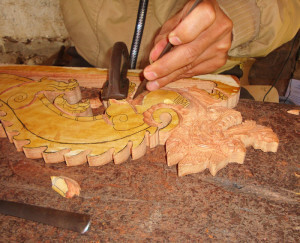 On our last visit in 2011, she confessed that the dozen or so pieces we usually purchase from her represent her only regular sales outlet – save one. Yes, she admitted, except for the rare one-time visitors (like us on our first visit), she sells exclusively through a select silk boutique in Singapore. Apparently, the Singaporean contact will take every piece she and her small team can create. A half-finished shawl on the loom – this weaver was too shy for a photo!